Tony Jaa's Field Team Leader cosplay is flawless. The first pictures to come out of the Monster Hunter film adaptation were not particularly reassuring, with Milla Jovovich posting Monster Hunter set photos of her hanging out with fellow cast members decked out military uniforms. There wasn’t an oversized sword in sight. The latest photo, however, couldn’t come from anything other than Monster Hunter. 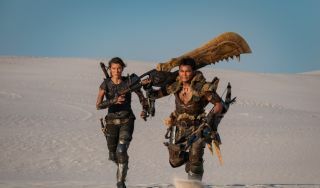 It shows Jovovich as Natalie Artemis, this time no longer decked out in modern military gear, accompanied by Tony Jaa, who looks almost exactly like Monster Hunter: World’s Field Team Leader, right down to the ridiculous Giant Jawblade. Artemis’ gear is equally inspired by Monster Hunter World, and you might recognise the swirly pattern on her top from the Odogaron chest piece, specifically the male version, from the game. And yes, that’s a slinger that she’s got strapped to her arm. She’s not wearing a specific armour set, instead opting for a mix, obviously going for the pieces with the best stats. The desert they’re running through, South Africa’s Atlantis Dunes, is meant to evoke Wildspire Wastes. Artemis will be traipsing across more than just the desert, however, and will visit different locations that might look familiar to players. So, at least it looks the part, which puts it well in front of a lot of terrible video game adaptations. Check out the synopsis below.